Put half the pork shoulder, half the pork belly, half the bacon, the liver and garlic in a food processor and blend until smooth. Add the remaining pork shoulder, pork belly, bacon and pulse until roughly chopped and well combined. Transfer to a bowl and stir in the orange juice and zest, brandy and herbs until well combined. Grind the peppercorns and juniper berries together with a pestle and mortar and add to the mixture. Stir until well combined. Cover the bowl with clingfilm and chill in the fridge for 1-3 hours. Spoon another third of the pâté mixture on top of the cornichons and press the surface smoothly and firmly. Cover with a second layer of cornichons and finish with the remaining pâté. 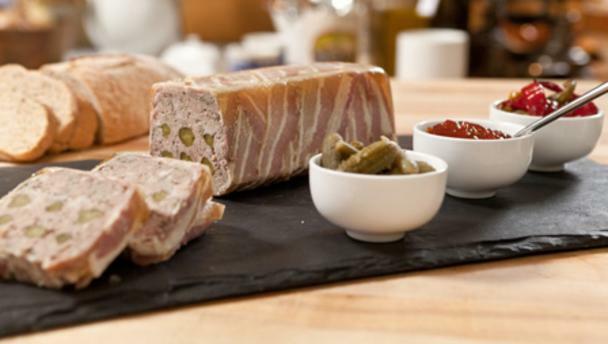 Bring the overlapping bacon up and over the pâté to cover the surface. Cover with the lid (or aluminium foil if using an ovenproof dish) and place the terrine into a small roasting tin. Add enough just-boiled water to the roasting tin to come 2cm/¾in up the outside of the terrine. Bake in the centre of the oven for 1½ hours. To test the terrine is ready, remove from the oven and insert a skewer into the centre. Hold for 10 seconds, then remove and lightly touch the end. The skewer should feel hot. The pâté should also have shrunk away from the sides of the terrine. Remove from the roasting tin. Remove the terrine lid, cover with a double layer of aluminium foil and place a couple of cans of beans or some other heavy weights on top. Leave to cool, then chill in the fridge overnight. The next day, turn the pate out onto a board and cut into thick slices. Serve with hot, crusty bread and lots of butter.